One mother is taking the internet by storm with a few waves of her magical pen after she wrote an unexpected absence note to her son's school. The fourth grade boy recently missed three days of school following a vacation to Universal Studio's The Wizarding World of Harry Potter. Even though the boy's mother cleared the absence with the school ahead of time, the school district automatically sends home a student attendance behavior improvement plan when students miss consecutive days of school. So, the mom decided to have a little fun when filling out the form. 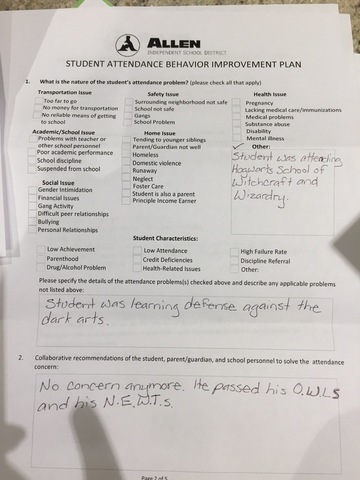 Among the explanations for her son's absence, this clever mom states he "was learning defense against the dark arts" while away from school. Seems like a legitimate excuse. The boy's aunt snapped a picture of the form and posted it to Reddit . With the note flying around social media faster than a witch on a broomstick, the writer has become the coolest Muggle mom in the world. No word from the school if it officially accepted the excuse, but at least the young man passed his O.W.L exams.